Clearly, curriculum and pedagogy must not be hostages to technological change at the level of artefacts. To a large extent this has been the history of CCTs in schools to date, with the result that all sorts of contrived practices have been created in order to find ways of accommodating new technologies to classroom ‘ways’. As Bigum … observes, this has not worked. 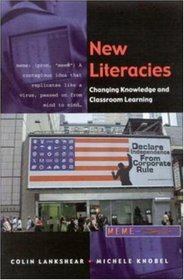 It has ‘wasted’ the potential of new technologies to provide bridges to new forms of social and cultural practice that school education could and should be interested in, like critical engagement with new literacies. It has simultaneously ‘wasted’ the potential that new technologies have for doing more efficiently the kinds of familiar ‘knowledge things’ that schools should be engaging learners in – such as forms of analysis and synthesis associated with evaluating and producing knowledge in expert-like ways. the principle of critical learning. According to this principle, for learning to be efficacious it is necessary that what somebody learns now is connected in meaningful and motivating ways to mature or insider versions of Discourses. Discourses are understood as sets of related social practices composed of particular ways of using language, acting and interacting, believing, valuing, gesturing, using tools and other artefacts within certain (appropriate) contexts such that one enacts or recognizes a particular social identity or way of doing and being in the world … . This involves thinking of education and learning in terms not of schools and children (place-related and age-specific) but, instead, in terms of human lives as trajectories through diverse social practices and institutions …. To learn something is to progress toward a fuller understanding and fluency with doing and being in ways that are recognized as proficient relative to recognized ways of ‘being in the world’. Participating in Discourses are things we get more or less right or more or less wrong. Mature or insider forms of Discourses are, so to speak, ‘the real thing’: the way a Discourse is ‘done’ by ‘mature users’ who ‘get it right’. They are ‘authentic’ rather than ‘pretend’ versions of the social practices in question. In this sense, for learning at times to be efficacious, it must involve doing something that genuinely puts the learner on the right track toward becoming a competent participant in ‘the real thing’ – whatever the Discourse in question might be. From a sociocultural perspective, learning is integrated to the extent that three conditions are met. These all relate to the key idea that learning is inseparable from Discourses. The first condition is that integrated learning occurs inside a practice rather than at a distance (as where one learns something about a practice at remove from participation in the practice itself, with a view to applying the learning in situ at some subsequent time). This is not to say that worthwhile learning cannot be decontextualized and subsequently applied; only that to this extent the learning is not integrated in the sense intended here. The second condition extends the first. Learning is integrated when the various ‘bits’ of social practices that go together to make up a practice as a whole – and where the various ‘bits’ of related social practices that go together to make up a Discourse as a whole – are learned in their relationships to one another, as a consequence of learning them inside the practice(s). In integrated learning we learn to put the various ‘bits’ (the speaking bits, tool and artefact-using bits, action/behaviour bits, valuing and believing and gesturing and dressing, etc., bits) ‘whole’ and ‘live’. We learn them organically in their relationships to each other, not as ‘chunks’ to be articulated later. The third condition is that our learning is the more integrated the less it clashes with who and what we are and do in the other discursive dimensions of our lives. The less the ‘identity’ we are called to be in this learning instance is in conflict with the identities we are called to be – and are at home with – in the rest of our lives, the more integrated the learning can be. Steve Thorne … provides an interesting example of how strongly students can feel about issues associated with the use of new technologies in learning. He describes a French foreign language course in which part of the course grade was based on a component requiring students to email a keypal in France. One student (Grace) chose to opt out of this component (and receive a lower grade as a result) because she associated emailing with ‘communication between power levels and generations’ … . She said emailing was what you did with teachers or parents. With friends you use Instant Messaging. Grace considered email an inappropriate cultural tool for the kinds of exchanges occurring between the US learners and their French keypals. Trying to get Grace to learn conversational-friendship French by means of email could not be integrated in this sense. Grace was, in effect, being asked to ‘mean against’ some of her other social identities and values that were important to her. Other things being equal, the less conflict learners experience with their other social identities, the more effectively and willingly they learn. This principle is partly an extension of the integrated learning principle, and partly the time-honoured principle that learning should build on what learners already know and have experienced. With respect to the first aspect, this principle involves looking for ways to reduce or ameliorate conflict between social identities during learning. For example, if an educationally acceptable appropriation of Grace’s cultural construction of age-peer/friendship communication (e.g., via IM) could be made within the French course, this would help integrate and strengthen learning by putting cultural, personal, technological, and epistemological aspects in sync. With respect to the second aspect, if learners already know how to perform discursive roles and tasks that can legitimately be carried over into new discursive spaces, this can be used to advantage to enable learning and proficiency in a new area. For example, knowing how to archive downloaded music onto an mp3 player like an iPod for personal entertainment purposes can readily be transferred to archiving interview data that has been recorded digitally for research purposes, without compromising either practice. The kinds of clash between cultures of use evident in the example of Grace are not likely to arise in this case. Of course, this aspect of the present principle – building learning on, and integrating into present learning, relevant knowledge and competence the learner already has – is practically self-evident. It is certainly widely recognized by educators. At the same time, it is systematically ignored or subverted on a massive scale within classroom learning. In various places, Gee … states very clearly a major dilemma with respect to effective learning construed socioculturally as processes of achieving fluent mastery of Discourses. This concerns the fact that becoming fluent in a Discourse is best achieved through processes of learning inside the Discourse. But the more effective this learning is, the less critically reflective the learner’s perspective on the Discourse will be, The more effective learning inside a Discourse is, the more deeply ‘indoctrinatory’ it is likely to be. As Gee notes, Discourses cannot countenance criticism from within, since that would be to invite their own demise or transcendence. This is problematic if we believe education should help prepare learners to understand the limitations and constitutive nature of each and every Discourse, and to be committed to and capable of playing active roles in trying to shape social practices in progressive and expansive ways on the basis of what they believe and value. From this standpoint, it is necessary to create spaces for developing and negotiating differing points of view on social practices, social identities, social institutions, and the like. This means creating spaces for experiencing different and competing Discourses and deciding how to handle this divergence.